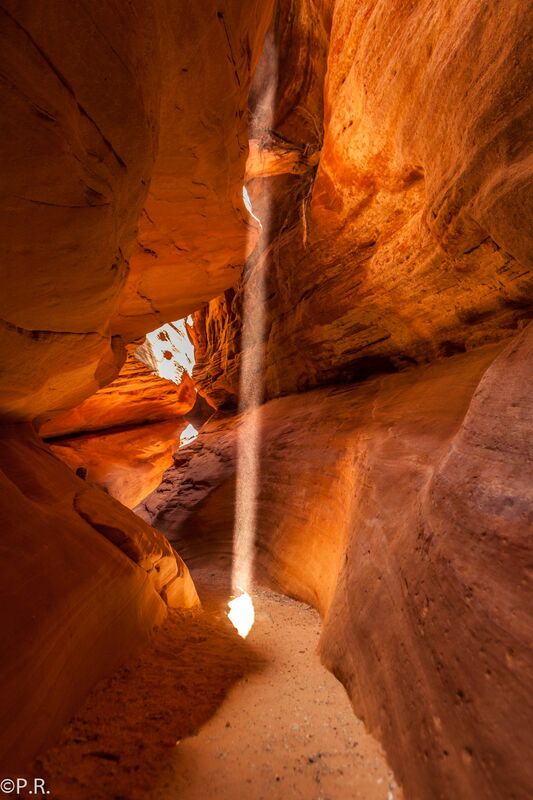 Red Canyon or as it’s called by the locals: Peek-a-Boo is a not very famous slot canyon just north of the adventure town Kanab in Utah. 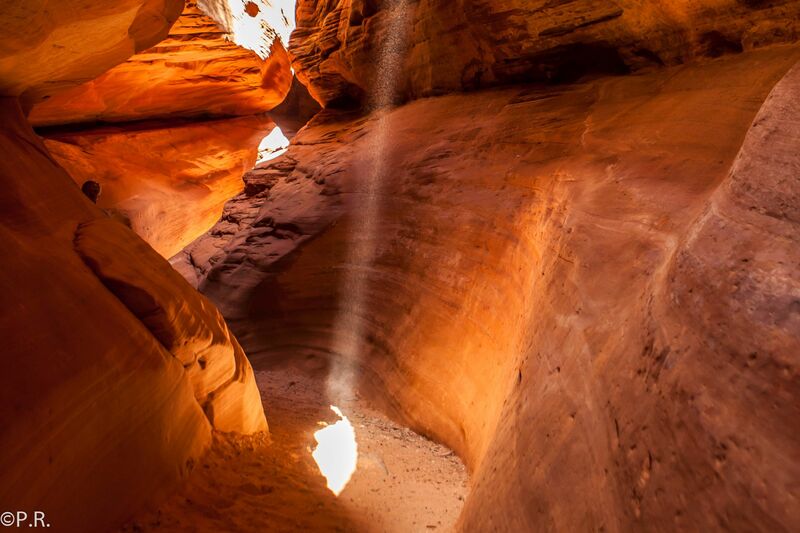 You probably have seen these images of slot canyons with light beams falling in. The most famous location for these photos is the Antelope Canyon in Arizona. Check out my review on the Lower Antelope Canyon as well. As it will give you more insights about how amazing Peekaboo really is. Peekaboo was created the same way as the Antelope Canyon. 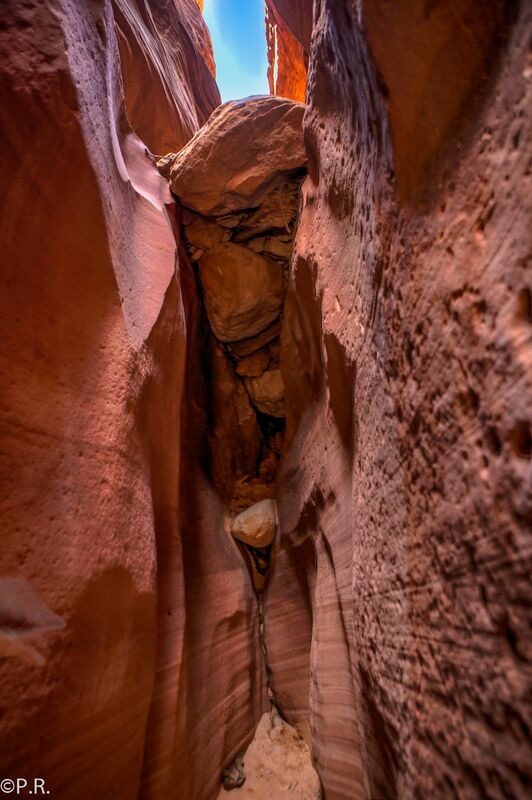 Water eroded the softer layers of the sandstone away and left this remarkable canyon for us to enjoy. The canyon is continuously changing with every flood coming through the canyon. Peekaboo has so many advantages compared to the more famous Antelope Canyon. Just outside of Kanab, UT. The only downside of this slot canyon is the location. You basically could drive all the way up to the entrance of the slot canyon if you know how to drive in deep sands and have a four-wheel-drive car or better an ATV. Otherwise, don’t even try! Many people get stuck here and have to get pulled out. Another possibility is to hike to the canyon from the parking lot next to the highway. It’s quite a walk and there is no shadow all the way to the canyon. And for the best pictures you want to go at high noon when the sun is its highest point, that’s also when the sun is brutally frying you on your hike. Before you try to drive there, check with the local visitor center about the trail conditions. They can change quickly and unexpected, especially after rain showers. 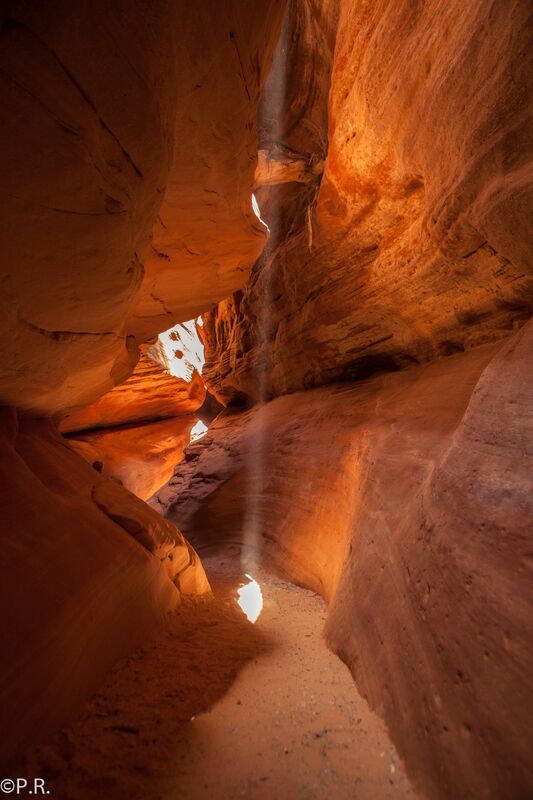 The best alternative to get there without putting yourself in danger is by going with a tour operator in Kanab. So which one should you choose? There are quite a few going out there to the canyon but I decided to go with WOW (Windows of the West) Hummer Tours. This added the bonus of riding a hummer to the canyon. I did my reservation the night before and had no issues getting a ticket confirmed. The website gave me a choice between a Hummer H1 and a Hummer H2. As a big fan, I opted for the H1. But as I had to learn the next day at the pick-up location it would be the H2 because the H1 was in the shop for a general overhaul for the upcoming season. The H2 was still an amazing vehicle and I would also call it a luxurious ride to the slot canyon. Leather seats and AC giving you the feeling of being the king of the trails here. Ken, the owner of WOW Hummer Tours, called me as we had a small misunderstanding about the pick-up location. This was sorted out quickly with the phone call and a few minutes later a white Hummer H2 pulled up in the parking lot. All excited I grabbed my backpack and loaded it up in the car. The only thing I wasn’t expecting was that the tour would become a private tour “just” for me. There were two more people scheduled who never showed up for whatever reason. After a short introduction, we were on our way to Peekaboo. Shortly after we left the main roads we let some air out of the tires to “float” over the upcoming sand trails. Ken is an amazing tour guide, a real local with lots of information about the area and its history. On the way down to the canyon, Ken pointed out information about the local Fauna and vegetation. A few minutes later we arrived at the entrance of the canyon. We parked the Hummer and after a quick water break, we headed off to explore the canyon. Ken knows all about the canyon and history. He explained how the canyon changes every year with the flash floods bringing more stuff downstream and taking other pieces further down the canyon. We went into the canyon about a half hour before noon and Ken gave me a great tour with all the details. As I mentioned earlier, when the sun is high in the sky it’s the best time to experience the light beams in the canyon. To better bring these beams to show up Ken through sand in the air and I started capturing 100’s of pictures to make sure I get some good shots. On our way in we only encountered one other tour guide coming already back out and we had the rest of the canyon for us. That is great to take your time for pictures and you don’t have any “tourists” running in your pictures. After a few more minutes we hit the dead end of the canyon and started turning around taking more and more pictures and that’s also when the light beams started to really show up inside the canyon walls. On our way out, we encountered more and more people coming into the canyon but our timing was just so perfect that we were not disturbed by anyone when we headed in. We spend about two hours in the canyon to enjoy the views and taking pictures. When I booked the tour with Ken, I booked the Rainbow Rock add-on option for the Peekaboo Canyon Tour. We boarded the Hummer again and started rolling towards the Rainbow Rock. On our way, we did a quick stop at a viewpoint with an amazing scenery. After that, we headed straight to Rainbow Rock along the old street leading into Kanab and is now used only by outdoor activists. From a distance, Rainbow Rock doesn’t look that amazing. It just looks like another big rock in Utah. Once you get closer you can see why the call the location Rainbow Rock. The different layers of the rock formation show up in different colors. After Rainbow Rock, we started heading back to Kanab. Ken took the scenic route through the Best Friends Animal Sanctuary. This canyon area was used to shoot a lot of Western movies and some of the old movie sets are still residing on the grounds what is now Best Friends Animal Sanctuary. If you are more interested in old Hollywood movie sets used for western, check out the “Little Hollywood” museum in Kanab. The admission is free and they have a bunch of sets out in the back. Some of them not in the best shape anymore. Ken dropped me back off at the Kanab Visitor Center where I parked my car. It was a real joy to go out on this ride with Ken. Disclaimer: All my opinions about the canyon and the Windows of the West Hummer Tours are my own.